The diameter of thie type of Cup Wheel is 125mm, the cup wheel is designed for granite, marble and other natural stone. 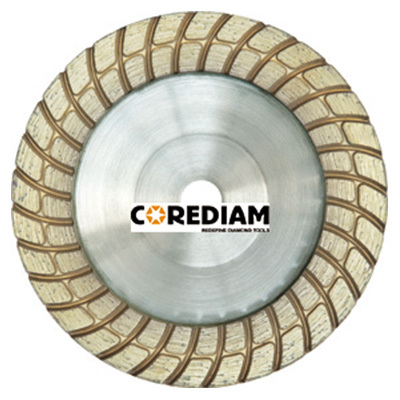 This Grinding tool is the most efficient tool applied in fast-grinding, edge-trimming, repairing and maintenance of concrete, stone and other similar material. It can be installed on the angle grinder. The turbo design makes this Abrasive Wheels are grinding fast and smoothly. The aluminum body is easily carried and light. The Diamond Cup Wheel can be used on angel grinder and pneumatic power tools, the regular diameter are: 100mm, 115mm, 125mm. We can supply other types of diamond cup wheels. Looking for ideal Diamond Cup Wheel Manufacturer & supplier ? We have a wide selection at great prices to help you get creative. All the Grinding Cup Wheel with Aluminum Core are quality guaranteed. We are China Origin Factory of Aluminum Body Grinding Cup Wheel. If you have any question, please feel free to contact us.